The bones of the human skeleton are classified by their shape: long bones, short bones, flat bones, sutural bones, sesamoid bones, and irregular bones (Figure 19.16). Figure 19.16. Shown are different types of bones: flat, irregular, long, short, and sesamoid. Long bones are longer than they are wide and have a shaft and two ends. 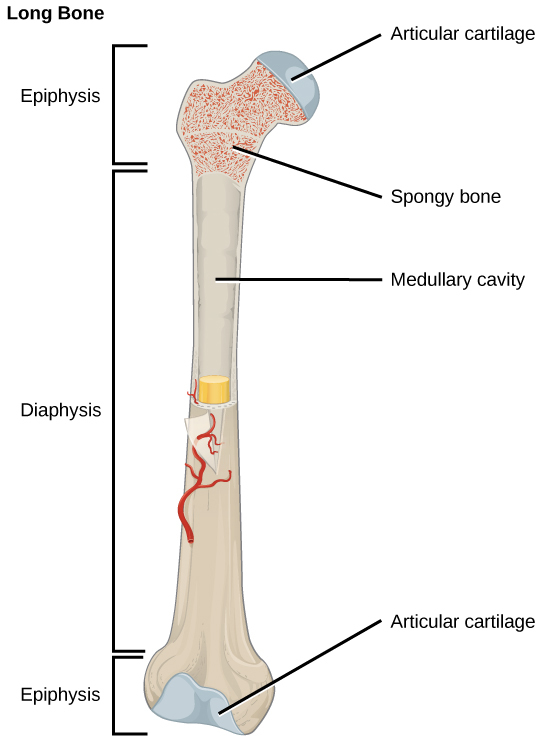 The diaphysis, or central shaft, contains bone marrow in a marrow cavity. The rounded ends, the epiphyses, are covered with articular cartilage and are filled with red bone marrow, which produces blood cells (Figure 19.17). Most of the limb bones are long bones—for example, the femur, tibia, ulna, and radius. Exceptions to this include the patella and the bones of the wrist and ankle. Short bones, or cuboidal bones, are bones that are the same width and length, giving them a cube-like shape. For example, the bones of the wrist (carpals) and ankle (tarsals) are short bones (Figure 19.16). Flat bones are thin and relatively broad bones that are found where extensive protection of organs is required or where broad surfaces of muscle attachment are required. Examples of flat bones are the sternum (breast bone), ribs, scapulae (shoulder blades), and the roof of the skull (Figure 19.16). Sesamoid bones are small, flat bones and are shaped similarly to a sesame seed. The patellae are sesamoid bones (Figure 19.18). Sesamoid bones develop inside tendons and may be found near joints at the knees, hands, and feet. Figure 19.19). Osteons in compact bone tissue are aligned in the same direction along lines of stress and help the bone resist bending or fracturing. 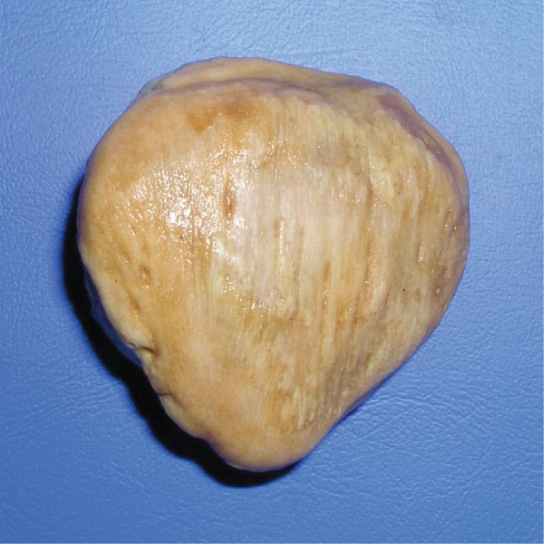 Therefore, compact bone tissue is prominent in areas of bone at which stresses are applied in only a few directions. The neck of the femur is horizontal like the toothpick in the wall. The weight of the body pushes it down near the joint, but the vertical diaphysis of the femur pushes it up at the other end. The neck of the femur must be strong enough to transfer the downward force of the body weight horizontally to the vertical shaft of the femur (Figure 19.20). 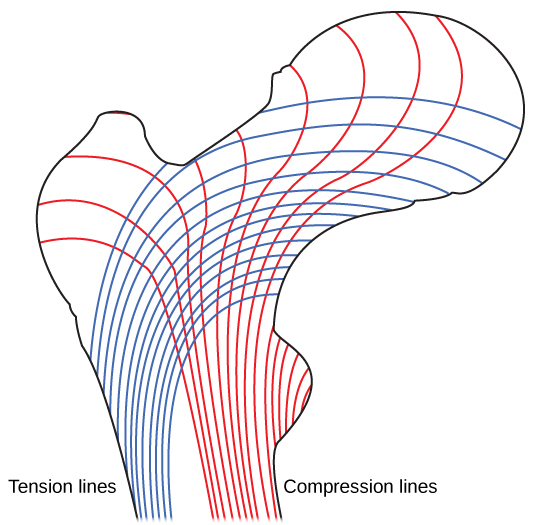 Trabeculae in spongy bone are arranged such that one side of the bone bears tension and the other withstands compression. is the process of bone development from hyaline cartilage. All of the bones of the body, except for the flat bones of the skull, mandible, and clavicles, are formed through endochondral ossification. In the last stage of prenatal bone development, the centers of the epiphyses begin to calcify. Secondary ossification centers form in the epiphyses as blood vessels and osteoblasts enter these areas and convert hyaline cartilage into spongy bone. 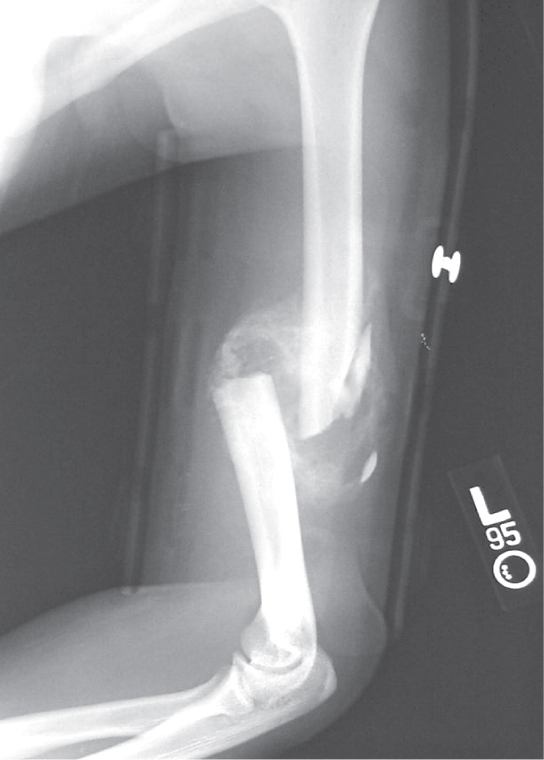 Until adolescence, hyaline cartilage persists at the epiphyseal plate (growth plate), which is the region between the diaphysis and epiphysis that is responsible for the lengthwise growth of long bones (Figure 19.21). Endochondral ossification is the process of bone development from hyaline cartilage. 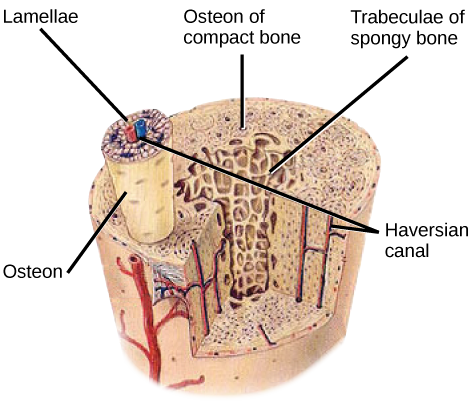 The periosteum is the connective tissue on the outside of bone that acts as the interface between bone, blood vessels, tendons, and ligaments. Within days of the fracture, capillaries grow into the hematoma, and phagocytic cells begin to clear away the dead cells. Though fragments of the blood clot may remain, fibroblasts and osteoblasts enter the area and begin to reform bone. Fibroblasts produce collagen fibers that connect the broken bone ends, and osteoblasts start to form spongy bone. The repair tissue between the broken bone ends is called the fibrocartilaginous callus, as it is composed of both hyaline and fibrocartilage (Figure 19.22). Some bone spicules may also appear at this point. 3. The cells responsible for bone resorption are ________. 4. Compact bone is composed of ________. 5. 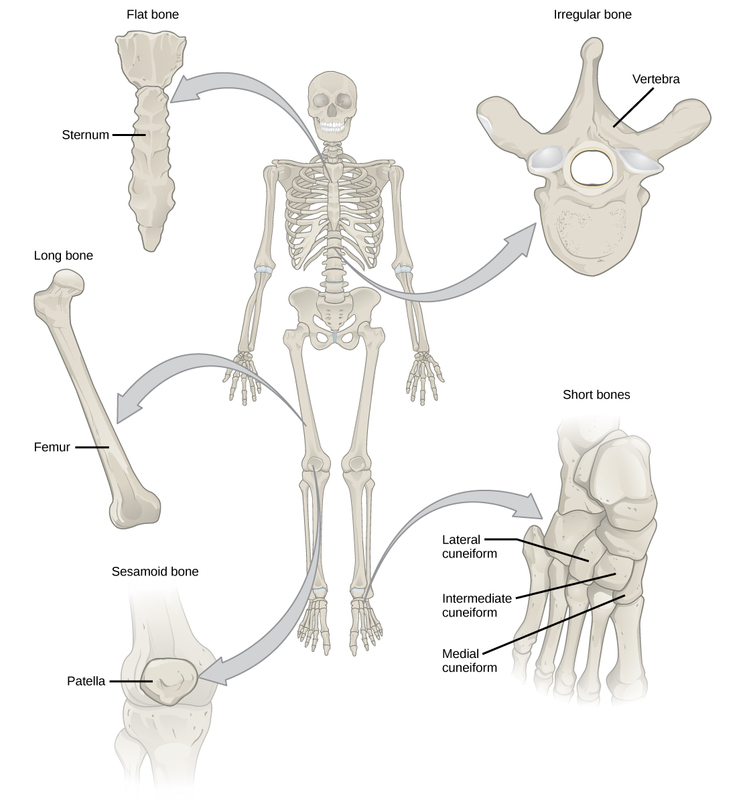 What are the major differences between spongy bone and compact bone? Compact bone tissue forms the hard external layer of all bones and consists of osteons. Compact bone tissue is prominent in areas of bone at which stresses are applied in only a few directions. Spongy bone tissue forms the inner layer of all bones and consists of trabeculae. Spongy bone is prominent in areas of bones that are not heavily stressed or at which stresses arrive from many directions. 6. What are the roles of osteoblasts, osteocytes, and osteoclasts? Osteocytes function in the exchange of nutrients and wastes with the blood. They also maintain normal bone structure by recycling the mineral salts in the bony matrix. Osteoclasts remove bone tissue by releasing lysosomal enzymes and acids that dissolve the bony matrix. Osteoblasts are bone cells that are responsible for bone formation. 19.2 Bone Copyright © by laesoph. All Rights Reserved.